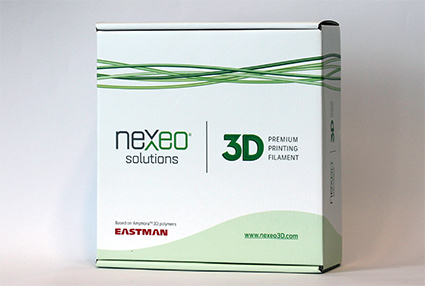 THE WOODLANDS, Texas, October 11, 2017 - Nexeo Solutions, Inc. (NASDAQ:NXEO), a leader in chemicals and plastics distribution, announced today the launch of new 3D printing filaments using Eastman AmphoraTM 3D polymers. These new transparent copolyester filaments, made with Amphora AM3300 and Amphora HT5300, are low-odor and styrene-free, which contribute to a quality user experience as well as a smooth finished product. By extending its materials portfolio with Amphora 3D polymers, an advanced range of copolyesters, Nexeo Solutions 3D offers one of the most demanded thermoplastics in the market. Filaments made with Amphora polymers demonstrate some of the highest performance among copolyester filaments, offering a quality option for concept validation and prototypes when used in 3D printing. “Expanding the portfolio to copolyester-based materials, the most widely used in 3D printing, allows our customers access to a wider range of quality filaments created from world-class thermoplastic producers.” said Shawn Williams, SVP Plastics at Nexeo Solutions. Amphora AM3300 is an optimal polymer for dedicated enthusiasts such as part designers or 3D printing professionals, who aim to innovate and thrive in different areas of creation. Amphora AM3300 has quality flow properties and exhibits advanced overhang ability, low warping, excellent finishing and a large operational temperature up to 75° C. This transparent and highly efficient polymer can help speed up printing times, makes printing easier, and prints difficult shapes with good dimensional stability. Amphora HT5300, based on Eastman Tritan™ copolyester, is a transparent low-odor, BPA (Bisphenol A) and styrene-free material exhibiting superior durability, dimensional stability and toughness. It is ideal for applications that require temperature resistance of up to 100°C. Due to its superior dimensional stability, Amphora HT5300 enables 3D printing to precise dimensions, which is especially important for products with tight tolerances and multiple component parts, like those often found on household appliances. Its properties make filaments based on Amphora HT5300 the optimal choice for industrial designers or injection molders looking for functional prototyping and durable parts solutions. Explore Nexeo Solutions full range of 3D printing materials at www.nexeo3D.com. Eastman is a global specialty chemical company that produces a broad range of products found in items people use every day. With a portfolio of specialty businesses, Eastman works with customers to deliver innovative products and solutions while maintaining a commitment to safety and sustainability. Its market-driven approaches take advantage of world-class technology platforms and leading positions in attractive end-markets such as transportation, building and construction, and consumables. Learn more at www.eastman.com.